Summer is in full swing! Trips to the beach are a welcome weekend getaway to beat the heat for everyone in the family – Fido included! Or maybe your backyard pool beckons your dog on hot summer days. Wherever you spend time cooling off with your dog this summer, remember these safety tips to prevent a drowning tragedy. Check the water for hazards. Look for blue-green algae and skip the swim if there are signs of this toxic bacteria in the water. Your dog can become very ill if he drinks water contaminated by blue-green algae. Be sure to check for fast moving water and debris or rocks that could injure your dog. No dog should be left unsupervised, whether it be at your backyard pool, the beach, or your favorite swimming hole. Your dog may suddenly tire and be unable to reach the shore or exit the pool, get into trouble in strong currents or riptides, or get caught up in debris or fishing line. It only takes a moment of unsupervised swimming for a dog (or human) to run into trouble. Not all dogs like water and some don’t have the natural instinct to do the “doggie-paddle”. 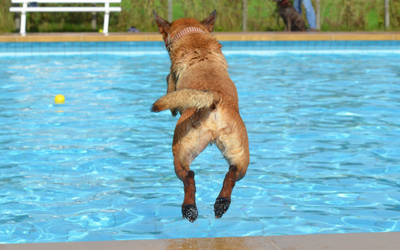 Do not force your dog to swim – it will only make him fearful of water and could have more serious consequences. If your dog panics, he may not be able to keep his head up and can quickly go under and drown. Teach your dog to swim if he doesn’t know how. If you don’t know where to start, consider enlisting the help of a dog trainer. Use a dog life vest until he has learned the swimming skills he needs, or for the dogs who just don’t seem to “get it”. Supervision is still required when your dog is wearing his life vest. If you are swimming in your pool, your dog may not be able to get out on his own. Train him to use the stairs or if small enough, lift him out when he swims to the edge. If you are at the ocean, watch for jelly fish. Your dog doesn’t know that he should avoid these stinging creatures. Don’t let your dog eat fish or other sea creatures that have washed up on shore – they can make him sick. Be especially cautious with young puppies and older dogs. Puppies may not have the needed swimming skills yet, and older dogs may not realize that they are not as strong as they used to be. Pay attention to your dog’s condition as the day goes on. If he appears to be getting tired, call it a day. If the water is cold and you are starting to feel cold, so is your dog and it’s time to call it quits. Your dog won’t understand that it’s the water that’s making him cold, and hypothermia is possible if he stays in the water. Make sure you offer your dog fresh water all day – swimming is exercise and your dog will need to replenish lost water. It is not ideal for your dog to drink water from the ocean (as it may cause vomiting, diarrhea, and dehydration), the river (as it may contain bacteria and parasites that can cause illnesses such Giardiosis, Cryptosporidiosis, Pseudomonas infections, and Leptospirosis), or the pool (as high chlorine levels can cause gastrointestinal upset). Be sure to rinse your dog off after swimming, whether he was in your pool, the ocean, or a river or lake. Salt water, chlorine, algae, and contaminants can irritate your dog’s skin. Be sure to give him a good rub down to help dry him off, and spend some extra time drying his ears to help prevent ear infections. Take a pet CPR course just in case. It may not be your pet that runs into trouble at the beach, but you will be prepared if your dog or someone else’s gets into trouble while at the beach. Keep cool this summer by enjoying a splash with your dog!